The convicts, members of Muslim Brotherhood, on trial for killing a police officer, attempted killing of two others, and other violence. A court in Egypt has sentenced to death 529 supporters of ousted Islamist President Mohammed Morsi, reported the BBC. The convicts, members of the Muslim Brotherhood, are part of a group of 545 defendants on trial for the killing of a police officer, attempted killing of two others, attacking a police station and other acts of violence. Only 123 of the defendants were present. The rest were either released, out on bail or on the run. Sixteen of the original defendants were acquitted. The court referred the defendants to the Grand Mufti, who issues legal opinions and edicts, and who must approve death sentences before they are carried out, Egyptian state television reports. Most of the defendants were arrested during clashes which erupted in the southern province of Minya after the forced dispersal of two Muslim Brotherhood protest camps in Cairo on August 14. A second group of about 700 defendants will be in the dock on Tuesday. They are accused of attacking people and public property in southern Egypt in August. Egyptian authorities have cracked down harshly on Islamists since Morsi was removed in July. 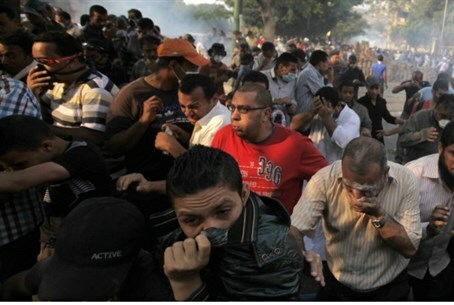 Thousands have been arrested in the clashes and hundreds killed. The court in Minya, south of the capital, Cairo, issued its ruling after only two sessions in which the defendants' lawyers complained they had no chance to present their case, the Associated Press news agency reports. The alleged attacks are said to have taken place in southern Egypt in August after security forces broke up two Cairo protest camps of Morsi supporters demanding his reinstatement. In the backlash that followed, hundreds of people were killed. The government has declared the Brotherhood a "terrorist" group.